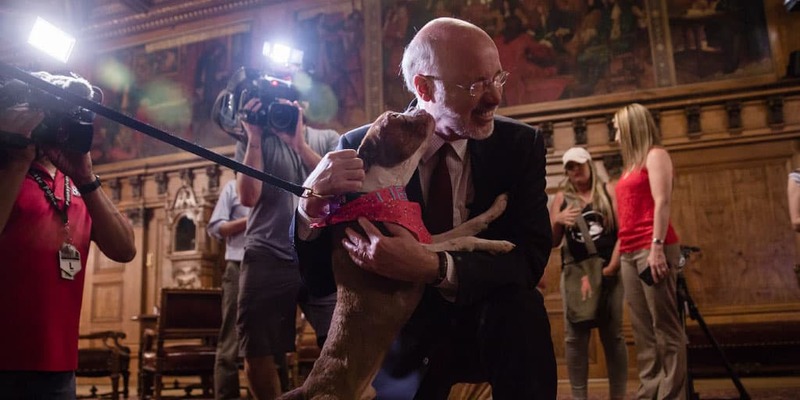 Harrisburg, PA – Governor Tom Wolf today signed legislation empowering law enforcement to take action to prevent the needless suffering of dogs and cats left unattended in cars. House Bill 1216, the Motor Vehicle Extreme Heat Protection Act, is the second major piece of legislation signed by the governor that increases protections for animals throughout the commonwealth. This law adds vehicle entry to an already existing law that allows officers to enter a property to provide care or impound an animal believed to be a victim of neglect or living below minimum care standards. Protecting a police officer, humane officer, or public safety professional who removes a dog or cat from an unattended vehicle from liability for any damages. Requiring that an officer who removes a dog or cat from an unattended vehicle must leave a conspicuous note for the owner stating the officer’s information and the information for where to pick up the pet. Updating the definition of neglect, prohibiting the confinement of a dog or cat in an unattended motor vehicle in a manner that would endanger the health and well-being of the animal. House Bill 1216 also expands the types of service dogs guaranteed protection in housing and public places.